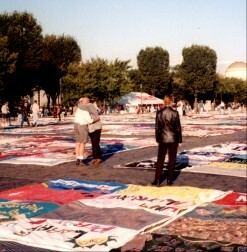 In 1996, we attended the final display of the AIDS quilt in Washington, DC. It was the final display of the complete quilt because the quilt, with over 70,000 names included in over 40,000 panels, had already outgrown the mall area. It stretched from the Washington Monument to the Capitol and was spilling out onto the side areas, with hundreds of new squares turned in at that display. Short of hiring the artist Christo (noted for unusual very large art displays) to find a place to display it, or renting the state of Kansas, it is unlikely that there will ever again be a display of "the entire" AIDS quilt. I had two goals in mind for that trip. One was to volunteer to be a quilt monitor and when my stint was over, I wanted to go looking for the square for Arthur Conrad (which I posted a picture of yesterday). 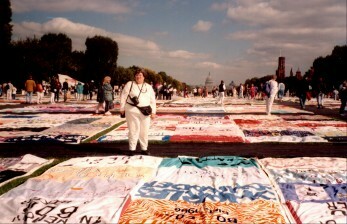 I had a friend who was an official photographer for The Names Project, who had been so affected by her years-long association with the quilt and who had said repeatedly that there were miracles that took place whenever the quilt was displayed anywhere. 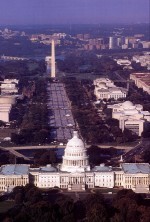 When I got to Washington, DC, I discovered what she meant. It was a busy day, a warm day, and we took the metro in from where we were staying in Gaithersburg. I rushed up the steps from the metro station to make it to the place where all the volunteers were to gather and found my group. We had been told to wear white, so we were all highly visible. I felt like a great white whale. We were there to get our assignments and find out our duties. Mostly we were there to guard a section of the quilt, to make sure that people didn't walk on it, that people were respectful, to comfort, if that was necessary, etc., etc. Our assignments of sections were totally arbitrary. My assignment was to the two rows that were the first, oldest, in the quilt. Directly across the street from the Washington monument. While I went off to look for my section, Walt went off to check out a guide to the quilt squares, so that when my stint was over, we'd know where to look for Arthur's square. I came up on my section and could not believe my eyes--there in front of me was Arthur's square. By sheer coincidence (or one of those "miracles" that Pat spoke of), I had been assigned to Arthur's section, and would spend two hours guarding his square (which is in the same quadrant as Liberace's). The coincidence doesn't end there, though. The serendipity continues. I never knew Arthur Conrad. But when I volunteered at the quilt, I had the honor of working a particular section of panels. My primary job was keeping people on the walkways and off the quilt panels, and handing out tissues and hugs. During that weekend, I got to know the names in my section very well. One panel struck me as more subtle, beautiful and stunningly moving than all of the others. The musical sign for "eternal rest". I decided a long time ago that I would never be able to reconcile the enormity of my losses. One of the ways I've coped with the grief is to sort of "adopt" two total strangers. One was a man named Alan Strunk. I have a candle in a jar that I picked up from the steps of the Lincoln Memorial after a candlelight march. On the outside of the jar is a sticker that reads, "Light this candle in memory of Alan Strunk." I've kept it. When I returned home from Washington, I decided to pack up and put away all the many little souvinirs of my friends' lives that I used to have all around my apartment... little reminders of all the friends I had lost. I decided this candle with a stranger's name on it would represent all of them. And I "adopted" Arthur Conrad. Again, it was too overwhelming to comprehend the losses of all of my friends who have panels on the quilt, so I let this second "stranger" represent all of them for me. Your journal entry today brought me to tears. I'm still kind of shaky. But I'm also struck by the amazing synchronicity of it. Thanks for posting Arthur's picture, and some details about his life. I "adopted" a very special man. The miracle of The Quilt continues. It is a crime that we have to have a quilt to draw attention to the enormity of the problem. It is a crime that our government gives only lip service to AIDS research. It is a crime that we are more focused on blowing up countries than trying to prevent anyone else from dying of this disease, that we have given only token funds for AIDS research, that we withhold funds from countries with whose policies we disagree...that our government is so short sighted that it can't see that its policies will result in too many more deaths, both in this country and around the world. The quilt will continue to grow and grow and grow. If not already, there will soon come a day when there won't be a single person in this country who has not known someone who died of this disease. And the saddest thing is that it didn't have to be this way. President Bush has not minced words about the global toll of AIDS and last June said its devastation "staggers the imagination and shocks the conscience." But urgent words do not amount to U.S. funding and action, the absence of which has repeatedly been criticized by international health officials. Dr. Jeffrey Sachs, the Harvard professor who is U.N. Secretary-General Kofi Annan's AIDS advisor, recently said the Bush administration had no coherent AIDS strategy. Heck, if I could find a profitable business venture that would not require much technical expertise, would I be scrubbing speculums on Sunday afternoons for $11.50 an hour? The statistics are frightening. And impressive. The news tonight, for example, said that in Sacramento, 75% of the people with AIDS are women. (That certainly has been my experiences through these months of working with Breaking Barriers.) Over half of the new cases of HIV in this country are in people under the age of 25. (A population that thinks AIDS is cured--or that it's "no big deal.") Some countries in Africa have been all but decimated by the disease.